The Teensy, Tiny, Insignificant Details: Admitting Defeat... But Not Defeated! 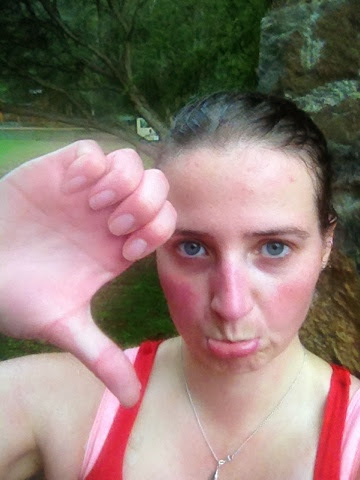 On Friday I tried for a slice of my normal life - doing the 1000 Steps walk in the Dandenongs. If you're not from Melbourne (or you are, and your idea of outdoor exercise is getting up to grab another beer out of the esky at a BBQ! ), it's a walk in a national park in a cooler, wetter, higher-altitude part of the outskirts of Melbourne. It's nearly 1000 unevenly-spaced and -sized steps separated by occasional, short bursts of walking track up a narrow, treefern-lined gully with just enough room to pass someone. I believe it was once just a walk to a picnic ground and was built in the 1920s, perhaps by returned soldiers (I might have made that up), but has in more recent times been renamed as the Kokoda memorial track, to commemorate the lives lost on the Kokoda Trail during World War II. Anyway, until I landed in l'hôpital I'd been doing the track for fitness purposes every week this year (except one, when it was above 40 degrees and the Dandenong Ranges looked like they were at risk of going up in smoke!). I started out quite slowly, taking the opportunities to stop and read the Kokoda memorial plaques every 12.8 seconds whilst I caught my breath, but just before I ended up in hospital I was getting to the top with just one quick stop. I'd knocked about 15 minutes off my original time, and was feeling pretty pleased with myself. You can imagine what a let-down being trapped in a hospital was for me, and why I walked so many laps of the ward while I was there! I got a bit less than halfway up and decided I wasn't feeling great and that it would be wiser to turn around, rather than push myself and do some kind of damage to my heart or the new pacemaker leads. I don't even know if they are legitimate risks, but considering you only have one blood-pumper and have no desire to repeat the surgery any time soon, it's probably best not to roll the dice on that one at the ripe ol' age of 31. Although I guess you could probably buy a new heart on the black market or, like, lure a foreign student into your home, get them hammered, put them in an ice bath and then...I'm kidding! I'm kidding! I mean, everyone knows that foreign students are for selling into indentured servitude, and hobos are for harvesting organs ;) Plus, yaknow, to replace a heart requires more surgery, which, wahhhhh. Haha, anyway, I'm not sure how much of feeling weird was that my body is still recovering from surgery, or that my fitness has declined that badly over the last month, or that I have just totally forgotten what it feels like to push yourself and get your heart rate going, but like I said, I didn't feel great so I bowed out. Oddly, as I did so, I had a totally random thought hit me that maybe that's why the contestants on The Biggest Loser often quit or struggle mentally early on - they feel all these unfamiliar sensations when they exercise, and it's scary. I mean, it's not the same thing by any stretch of the imagination...but I guess I have a bit more empathy now. Well, empathy over the sensation and the fear, anyhow. If you don't know me well, or at all, you may not realise how hard it was for me to turn around without achieving my goal. Yes, I'm normally slow. Yes, I have never been sporty or athletic. But I am one stubborn human being, stubborn to a fault, and when I decide to do something I rarely give up. Even if that means that other, less positive things then occur as a result. So this was a pretty landmark moment in the development of my emotional maturity! I feel like I'm recovering a million times better from this surgery in terms of pain levels and mobility, but in terms of heart function I feel like I've taken a backwards step. I'm trying to cast my mind back six years to the first time I had a new lead put in my atrium (this time around I had two new leads and a new device implanted, one into my atrium and the other into my ventricle, but the previous surgery was just adding a lead to the ventricle), and figure out whether what I'm feeling is comparable. And I think that maybe it is. I remember feeling breathless and weak. I remember it being a lot worse than this - weeks on end of walking no faster than about 2km/hr for fear of inciting those breathless feelings and irregular rhythms - but I'm not sure whether it actually was worse (possible, considering I was going through a period of abnormal cardiac activity - or a "storm of activity", as my EP at the time described it), or whether it was because I had just come through said storm, including being defibrillated several times, and it was all a bit new, so every time I felt a bit off-colour it was panic stations. So I'm trying to consider that, and to be patient. Going in my favour is the fact that I haven't just come through one of those storms - I went into this surgery in apparent rude health, with ne'er an ectopic beat to be seen. I do remember one of the coronary care nurses at the Royal Adelaide Hospital telling me that new leads can cause a bit of irritation to the heart muscle until they settle in, and that can occasionally cause irregular heartbeats for a time. I also remember that, despite the fact that the part of the RAH I was in was remeniscent of the antiquity of the hospital in Cuzco (rural Peru! ), the doctors and nurses at the RAH were exceptionally knowledgable, experienced and reassuring, and far, far better at their jobs on all counts than those at the Austin where my first ICD surgery took place, so I'm somewhat more inclined to take on board what that nurse told me. So I guess it's a waiting game. I've dipped my toe in the water, and I'm not feeling great but at least now I have something to build on. I have a tangible point at the steps to beat, and none of my friends had to kick my arse over me over-exerting myself! I also have experience under my belt, so I know that it actually gets better, rather than just vaguely hoping that it will. And that is a hell of a long way from the mindset of that distraught girl alone and at rock-bottom in the RAH, 800km from home, thinking "there's got to be more to life than this. It has to get better." So I will be back, and soon. And believe me, you'll know about it when I am! But even if it takes me five more times to get to the top, well sure, I'll pout and whinge, but I won't let it get me down. Because admitting defeat in the short term beats the pants off being defeated in the long term.